Living large comes easy at the opulent Villa Horizon. 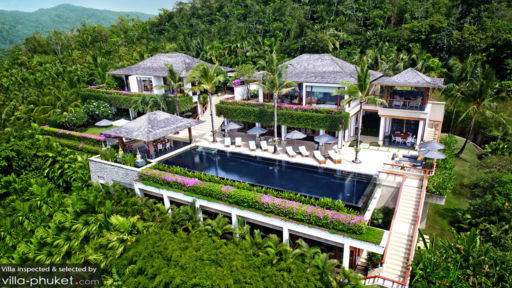 A magical villa experience awaits; step past the wooden gates into a sprawling compound spanning 1,300 square metres, where you’ll find a glistening infinity pool, beautifully landscaped grounds and impeccably furnished living spaces. 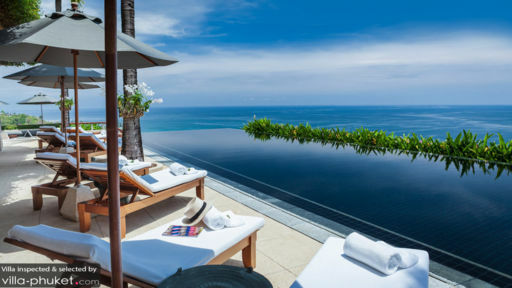 Perched atop the hills, Villa Horizon offers incredible coastal views out to the beaches of Kamala, Laem Singh, Surin and Bangtao. 12 guests are housed in six bedrooms, from which you’ll enjoy views out to the ocean or garden. A flat screen TV with DVD player, writing desk, relax chair, balcony and private en suite are amenities common to all bedrooms. Covered walkways lead you from the living pavilions to an oceanfront infinity pool flanked by sun loungers and patio umbrellas. Seeking relief for tense, aching muscles? Don’t fret - let the hydrotherapy jacuzzi jets sort out the aches and tension. The commodious grounds offer ample choices for outdoor relaxation: will it be the sunken lounge, sun-soaked deck with an outdoor bar or breezy outdoor dining sala? Each of the communal living spaces ooze vibes of luxury and elegance with its wood panel flooring, soft fabrics, earth-toned colours and oriental ornaments. The fully equipped kitchen comes complete with amenities like a barbecue grill, so your private chef will have everything he needs to whip up scrumptious feasts. A range of luxurious indoor amenities leave guests with plenty of choices for entertainment or relaxation. Work up a sweat in the gym, enjoy a pampering massage in the spa room, play a round of pool in the games room or catch up on your favourite films in the media room. Villa Horizon offers housekeeping, security and personal guest services. Airport transfers are included with your stay, as are kid-friendly amenities like a baby cot and high chair. Other amenities available at additional cost include: personal driver service, laundry service, in-villa massages and personal chef services. 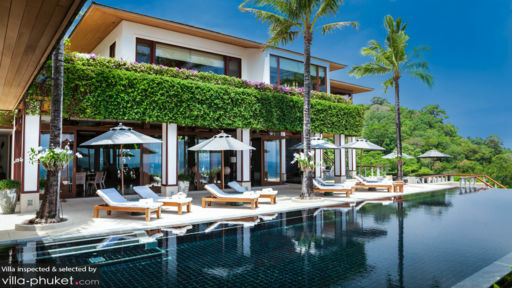 Villa Horizon is located in Kamala Beach town, West Phuket. Unlike Patong, Kamala Beach exudes a more laid back vibe, and appeals to expatriates and family vacationers. Spend the day out at Kamala Beach, where crystal clear waters are framed by a powdery white sand coast. It’s a great venue for trying out stand up paddling, surfing and diving. Restaurants and beach bars are dotted all along the coast, providing beach-goers with a good selection of dining options. Just 10 minutes’ walk away is Kamala Night Market, a bustling outdoor venue where travellers may experience the local shopping and street food scene. Amenities located in the vicinity include Spa by Paresa, an luxury spa venue with views out to the Andaman Sea. Choose from a wide-ranging array of spa and beauty treatments, as well as yoga, reiki and meditation sessions. Group yoga classes are also available at Anantra Yoga Patong and iYOGA. Plan a day trip around attractions like Wat Chalong, Big buddha, Khao Rang Viewpoint and Old Phuket Town - it’ll be an experience that the entire family will enjoy! The authentic Thai service that the villa provides is great, nothing beats sipping a fresh coconut overlooking infinity pool onto the sea. The environment that has been created makes you hardly want to leave the villa. The villa is really is own compound, with a gym, game room, spa and pool. Cant say good enough things, thanks to our great hosts.